Harrow builders LJ Refurbishments - Experience and precision are key words for us. Our objective is to make you proud. Harrow builders LJ Refurbishments - Beautiful bespoke furniture, made to measure using our design or yours. Beautifully coloured and patterned boards for your bespoke furniture to choose from. LJ Refurbishments - Experts at building your home extensions and loft conversions. Builders Pinner & Harrow LJ Refurbishments are a North London based refurbishment and building company, specialising in creating beautiful bespoke furniture and serving Harrow, Northwood, Pinner and surrounding areas. We pride ourselves on delivering the best possible results in line with our customers expectations. We are highly skilled and have a wide range of experience working with clients around London, the UK and abroad. Please take a look at our testimonials for a closer look at the clients we have worked for and their opinion of our work. Click here to take a look at how LJ Refurbishments have been helping the BBC recently. All the work was carried out to a very high standard with much attention to detail, using a high degree of skill. I was impressed with the quality and range of the various hand-tools and wood machine equipment he used. Mr Dawes put down dust sheets/plastic sheeting each day and swept up /cleaned all work areas at the end of each day, all tools etc were cleaned. All in all, I was extremely satisfied with his work and am happy to recommend him to others. 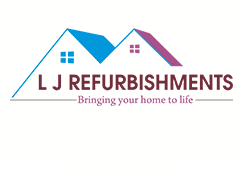 LJ Refurbishments are able to cover all necessary building, plumbing, heating, electrical trades and are also able to organise soft furnishings, carpets and furniture. LJ have proved reliable and trustworthy and provide the high standard of workmanship demanded. I would have no hesitation in recommending them to any interested party. I would like to write to thank you for the excellent service you have provided to Whitbread over the last three years. Should you require any references at any time, please do not hesitate to contact me.